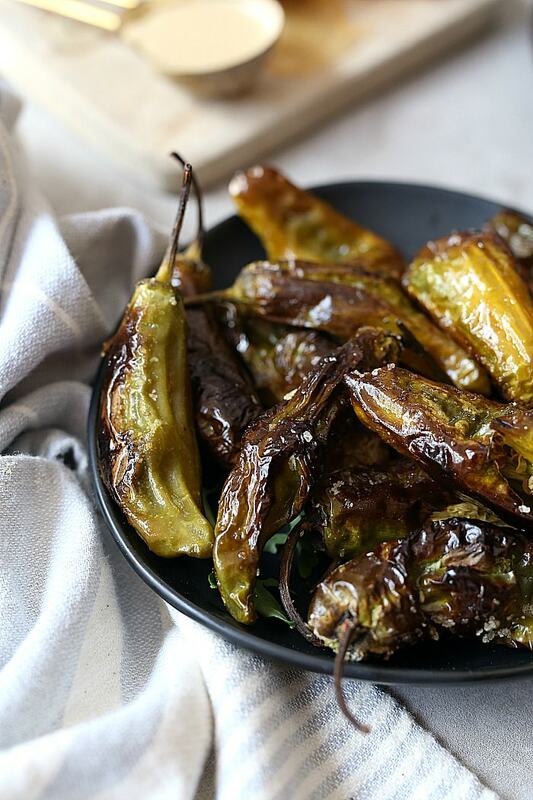 Roasted shishito peppers are a favorite appetizer around here! 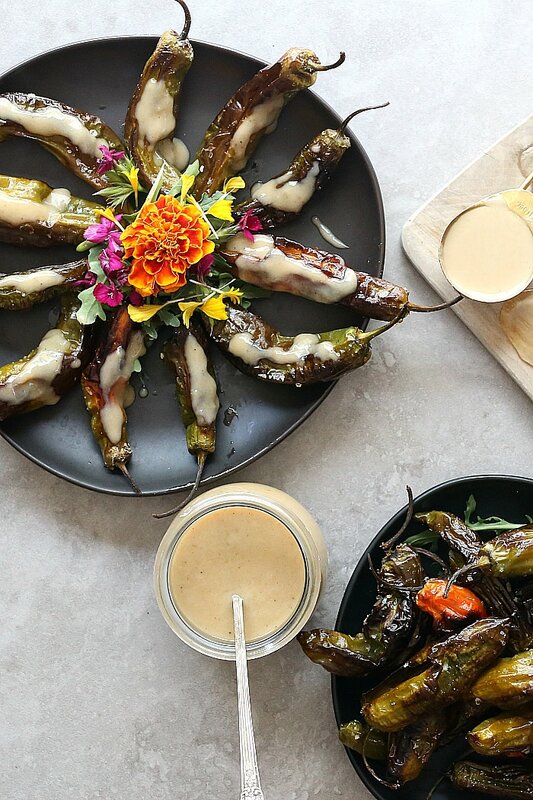 These adorable slender peppers are ready in 25 minutes and fantastic served dipped in garlicky rich tahini sauce. Shishito peppers are small, finger-long, slender and packed with delicious flavor more delicate than that of a bell pepper. 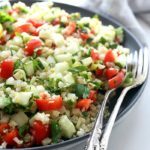 It comes from East Asia and has become one our family’s new favorite vegetables to enjoy in tacos, salads, as an appetizer or served on the side at the dinner table. They are delicious in a bit of olive oil, salt and pepper either raw or cooked. Our ultimate favorite is to bake them on a sheet pan to turn their thin skin into a blistering char texture that will have you swooning for more! Can’t just eat one (just like potato chips but way healthier) ! Have you tried shishito peppers yet? They are light with an appearance similar to a chili pepper. Fun Fact that one in every 10 of them is spicy. I have yet to have one that is spicy (and I have had a few batches) so it is kind of a fun guessing game with these roasted shishito peppers, ehhh? The hubby and I went out to celebrate a birthday at Oliver’s in Montecito, CA. A place to surly try if you visit the Santa Barbara area. One of the appetizers served was roasted shishito peppers drizzled with a delicious creamy sauce. We were all mind blown how flavorful these tasty little peppers are. 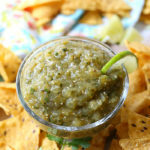 A recipe I knew I had to replicate so we (and you) can continue to enjoy it at home too! Shishito peppers have serious prodigious taste and they are in season during the summer months! Perfect paired with summer recipes like chickpea corn salad and blackened rockfish. Or perhaps just enjoy them as a healthy weekend snack! To roast the peppers toss them in olive oil, salt and pepper. Easy as pie (although is pie really that easy??). This is WAY easier than pie. 🙂 That’s all you need because shishito peppers have an abundance of natural flavors that emerge with salt when roasting in the oven. Bake them on a sheet pan at 425 degrees F for 20 minutes until they are bubbly and slightly charred. Olive oil can only heat up to 425 degrees F otherwise it turns into an unhealthy fat. We don’t want that. As shishito peppers are cooking they flare up with air like blow fish and as soon as they cool they deflate. 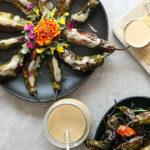 When the shishito peppers are finished cooking they are delicious served warm with a favorite dressing or this easy tahini sauce. It took me a while to perfect this tahini sauce and it finally happened. Tahini is a popular sauce in Middle Eastern cuisine. I wanted to keep this dish vegan so instead of using an aioli, I combined it with tahini sauce. You might prefer aioli in which this yogurt aioli would be fabulous too. 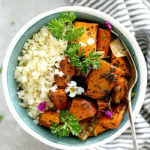 Tahini sauce is vegan, light and palatable made with ground sesame seeds, garlic and lemon pureed to smooth perfection. At first there was too much this and that but what it boils down to in the end is to keep the ingredients simple. Simple ingredients and only use the freshest. So I switched from garlic salt to fresh garlic and a better tahini paste and believe me that made all the difference. To make this tahini sauce add tahini paste, water, lemon, seasonings and fresh garlic to a food processor and pulse until it is smooth. To sweetened it (if you like a sweeter side) add 1-2 teaspoons of maple syrup, agave or honey. Roasted vegetables are a staple dinner item around here as are roasted shishito peppers which have been added to our monthly menu! Try these roasted peppers as a side dish, appetizer or topped on a favorite salad! 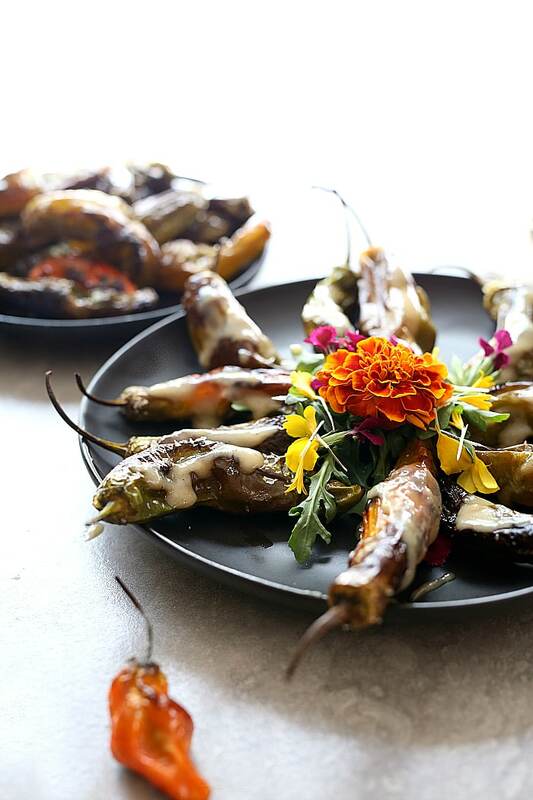 Roasted shishito peppers are a favorite appetizer around here! Ready in 25 minutes and fantastic served dipped in garlicky rich tahini sauce. Preheat the oven to 425 degrees F. In a mixing bowl add the shishito peppers, olive oil, salt and pepper and using your hands toss to coat. Spread the peppers on a baking sheet evenly and not overlapping. Bake for 20 minutes and serve immediately. While the peppers are cooking or ahead of time make the tahini sauce. With a food processor add the water, tahini, cumin, salt, lemon juice and garlic cloves. Blend until smooth. The mixture will thicken as it sets in the refrigerator. Optional to add 1-2 teaspoons of maple syrup or honey to sweeten it. Serve with roasted shishito peppers. The tahini sauce makes about ¾ cup so enjoy it as a dressing for another meal.